The All-star fantasy epic "The Monkey King" is likely to dominate the Chinese film market and beyond during the Spring Festival season, one of its producers said confidently in an exclusive interview with China.org.cn. "The Monkey King," the newest adaption of the Chinese classic ancient novel "Journey to the West," written by Wu Cheng'en in the Ming Dynasty, will be screened all over China from Jan. 31, the first day of the Chinese lunar New Year. The film is directed by Hong Kong director Cheang Pou-Soi and stars Chinese movie stars Donnie Yen, Chow Yun-fat, Aaron Kwok, Joe Chen, Peter Ho, Kelly Chen, Zhang Zilin and Gigi Leung. "The director told me a few days ago that it is not just a film. It is like a big engineering project," said Wang Haifeng, chairman of the film's production company, the Filmko Entertainment Group. "I totally agree. We have spent years making it happen and we should be thankful to the thousands of people who worked on the film." According to Wang, the film is the true blockbuster and cost a total of 500 million yuan (US$82.6 million) to make and promote. About 250 million yuan (US$41.3 million) was spent on the filming and the rest was spent on post-production, distribution and promotion. "Actually, we only spent 70 million yuan (US$11.5 million) on the all-star cast," he said, "The major expenditure was on the special effects." The "Monkey King" production team asked Hollywood top-class special effects veterans and companies for help. The film's 3D design was done by Daniel L. Symmes, who worked on "The Pirates of the Caribbean: On Stranger Tides" and "Transformers: Dark of the Moon" while the make-up effects were done by Shaun Smith and his team, who worked on "300" and "I Am Legend." The visual effects advisor is David Ebner, who worked on "Alice in Wonderland" and "Spider-Man 3" while the visual effects supervisor Kevin Rafferty, who worked on "Men in Black II" and "Star Wars: Episode I - The Phantom Menace." "We lavished more than 200 million yuan on special effects. While Chinese visual effects companies worked on hundreds of scenes, nearly 2,000 scenes were done by international teams in North America, South Korea, India, Thailand and Australia," Wang said. The "Monkey King" project was begun in 2008, and the filming started in 2010, when the producers felt that film technology had developed enough to depict the fantasy scenes from "Journey to the West," after watching "The Lord of the Rings" trilogy. At this time, the Chinese film market also started to expand rapidly. The project is more than meets the eye. Wang Haifeng, Chow Yun-fat and Donnie Yen discussed and voted for director Cheang Pou-Soi, who is known for "Home Sweet Home," "Dog Bite Dog" and "Accident," because he is completely dedicated to the films he makes. They then recruited three famous script writers, Edmond Wong ("Ip Man 2"), Lola Huo ("Journey to the West: Conquering the Demons" and "Kung Fu Hustle") and Kam-Yuen Szeto ("Too Many Ways to Be No. 1" and "Exiled"). "Our script writers loved the novel very much, so they worked very hard on this film," Wang said. "The film has hundreds of settings and roles, and they did their best to tell a good story that both the old and young will enjoy." The film "Monkey King," whose Chinese title is "Havoc in Heaven," comes from the first eight chapters of the classic novel, telling the story of how the monkey Sun Wukong learns to be immortal and rebels against the Jade Emperor of heaven. This is before he accompanies the monk Xuanzang on a journey west to collect the Buddhist sutras from India during the Tang Dynasty. 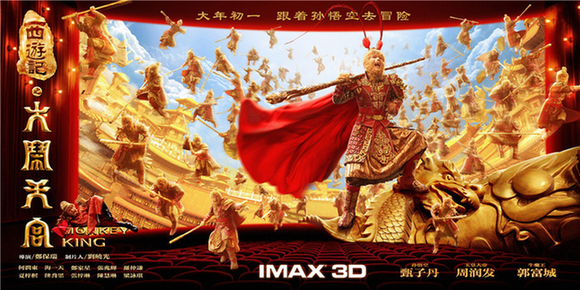 The 3D/IMAX "Monkey King" is set to make huge takings at the box offices. Wang said they have also sold distribution rights to 70 countries and regions including the United States and Australia, though it is too early to say if the film will be able to match the success of Stephen Chow's "Journey to the West: Conquering the Demons," which made US$208.8 million worldwide after it opened on the lunar New Year's Day last year, making it the second highest grossing film ever in the Chinese mainland. For Wang, however, this is not the most important thing. "Filmmaking is like making a dream," he said. "It is worth any amount of money to have the opportunity to put the 'Monkey King' on the big screen."